2. THRESHOLD LIMITS UNDER COMPANIES ACT, 2013. 3. NOTES FOR SECTION- 188. 4. DEFINITION OF RELATED PARTY BY DIAGRAMS. A. Whether the provisions pertaining to „related parties‟ are applicable based on a financial year? Solu. NO,The provisions pertaining to „related party‟ and „related party transactions‟ are applicable for all contracts or arrangements with related parties entered on or after 1 April 2014, irrespective of the accounting year followed by the Company. B. What is the effective date of applicability of the provisions/ sections/ rules relating to related party transactions? C. A corporate group has several foreign subsidiaries. Will provisions in relation to related parties apply to foreign companies as well? Solu. The term ‘company’, as defined under the Companies Act 2013, is a company incorporated under this Act or any previous company law. Company incorporated under the relevant legislation of a foreign country is not a ‘company’ under Companies Act 2013. 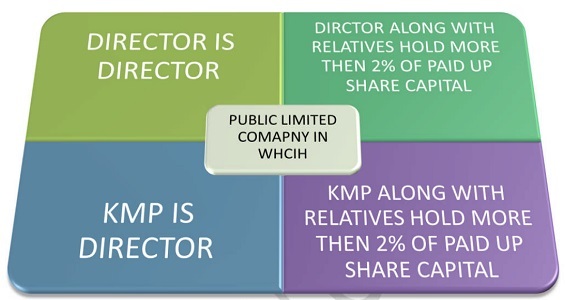 However, transactions by Indian company with a foreign company, which is a subsidiary, associate, fellow subsidiary, joint venture of the same venturer or company under control of same promoter, would be covered, based on understanding of combined reading of revised clause 49 and Companies Act 2013. 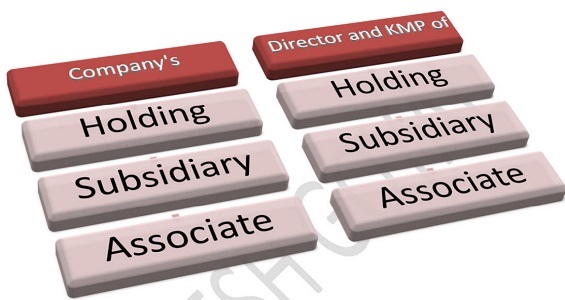 D. In case of Companies Act, is the board required to approve all related party transactions? E. Whether the contracts or arrangements of transactions with related parties entered on or before 1 April 2014 are also governed by the provisions of the 2013 Act? No, the contracts or arrangements of transactions with related parties entered on or before 1 April 2014 shall continue to be governed by the provisions of the erstwhile Act, and other applicable provisions. F. Whether any modification in the contracts or arrangements of transactions with related parties entered on or before 1 April 2014 are also governed by the provisions of the 2013 Act? G. In Listed Companies:Whether the contracts or arrangements of transactions with related parties entered on or before 1 October 2014 and will continue beyond 31st March 2014, are also governed by the provisions of the 2013 Act? Such contracts or arrangements for material transactions shall be placed for approval before the shareholders in the first general meeting held after 1 October 2014. H. Whether the provisions relating to special resolution under Section 188 are also applicable to transactions with wholly owned subsidiaries? No! Wholly owned subsidiary companies are exempted from the requirement of passing a special resolution, provided requirement of the special resolutions have been complied by the holding company. I. Can there be a situation in which contracts or arrangements require special resolution with related party only under amended listing agreement, and not under the 2013 Act? J. How to compute annual turnover and net-worth for the purposes of Rule 15(3) and Clause 49? K. Whether the thresholds Sub-rule 3 of Rule 15 the Board Meeting Rules, 2014 is applicable to individual transaction of sale or purchase or is applicable at an aggregate level? The Second amendment to the Board Meeting Rules 2014 includes an explanation clarifying that the limits listed under the sub-rule 3(i) to (iv), shall apply for transaction or transactions to be entered into either individually or taken together with all the previous transactions during a financial year. L. Can a related party transaction entered into without obtaining approval from the board/ members be ratified subsequently? Yes, contract or arrangement entered into without obtaining the consent of the board or approval by a special resolution in the general meeting, as the case may be, shall be ratified by the board or members, by way of a special resolution, within three months from the date of such contract or arrangement being entered. M. Can a director who is interested in a contract or arrangement with a related party be present during the discussion at the board meeting for approval of such transactions? 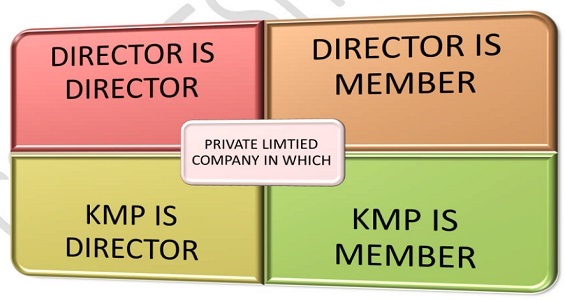 Pursuant to the provisions of Sub rule 2 of Rule 15 of the Companies Board Meeting Rules, 2014, none of the interested directors shall be present during the course of discussions at the board meeting. N. What are the provisions of the 2013 Act and clause 49, in connection with voting rights of related party at the general meeting? O. How to interpret the term “Ordinary Course of its Business” (OCB) as used in the context of „related party transaction‟ under the 2013 Act? 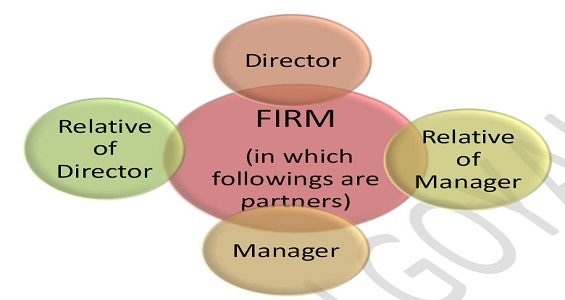 which are directly or indirectly connected to or necessary to conduct its business. For example, company ABC which is primarily engaged in the business of manufacturing and selling auto parts, and advancing loans to a related party which is in the business of providing information technology services, could be viewed as a transaction not in the OCB. Whereas, if the company ABC entered into a contract with related party to avail travel services for its employees/ staff, such services, being necessary for ABC‟s ordinary activities, could be regarded as transaction in the OCB. P. Whether provisions of the Companies Act, 2013 and relevant rules framed thereunder are applicable to every company? Q. Powers of Board to Approve any related party transaction. R. Powers of Audit Committee to Approve any related party transaction. A Company having an audit committee, under Section 177 of the 2013 Act Audit committee shall approve all related party transactions; and· Subsequent modifications to the previously approved related party transactions. ii. transactions which are in the ordinary course of the business, but are carried at other than arm’s length price. 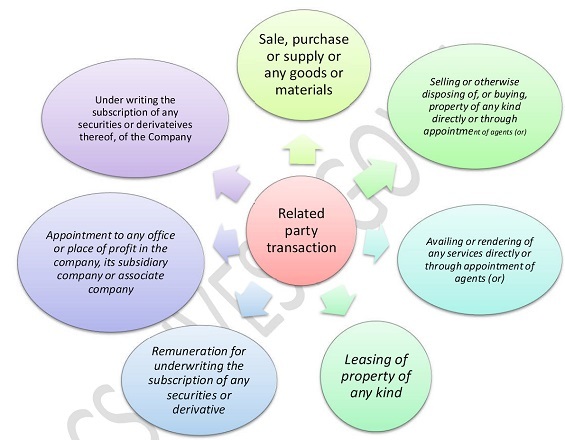 T. Power of approval of Related Party Transactions in the Listed Company. U. List of Transactions which are covered under Section 188 of Companies Act, 2013. V. Applicability of Section 188. W. Definition of Related Party. Given below in chart form. X. When Contract will be voidable under Companies Act, 2013? i. Prior approval from Board is required. Further, in certain cases, prior approval of shareholders by way of special resolution is also required. ii. The details of the proposed transaction shall be circulated in the notice of the meeting. iii. The details and justification of the special transactions shall be referred in the Board’s Report. iv. Any director, interested in the transaction shall not be part of the meeting and he will also not vote in passing the Special Resolution, where applicable. i. Turnover and Net worth as per Audited Financial Statement of Preceding Financial Year. ii. If any member is interested in any transaction, than such member shall not cast vote in meeting regarding such resolution. iii. It is here by clarified that the limits specified in sub-clause (i) to (iv)shall apply for Transaction and Transactions to be entered into either individually or taken together with previous transactions during a financial year. iv. Every Transaction enter into section 188 shall be enter into Director Report along with Justification. vii. any other information relevant or important for the Board to take a decision on the proposed transaction. v. any other information relevant or important for the members to take a decision on the proposed resolution. The particulars of contracts or arrangement with related parties referred in section 188(1) of the Companies Act 2013 should be disclosed in the Directors Report for the financial years commencing on or after April 1, 2014 in Form AOC-2 enclosed as Annexure-I. All material related party transactions that are entered into with effect from October 1, 2014, to be disclosed quarterly along with the compliance report on corporate governance pursuant to the requirements of clause 49 of the Listing Agreement. The company shall disclose the policy on dealing with Related Party Transactions on its website and a web link thereto shall be provided in the Annual Report. very well note, really appreciable. one doubt : whether interest on loan of Directors and payment of Managerial remuneration is comes under the aforesaid threshold?.. doubt-whether interest on unsecured loan is covered under this contract?